The Battle of Bosworth was big. It was the last time an English King died in battle. It was the end of the Plantagenet line when Richard III was cut down and led to the Tudor Dynasty when Henry VII was crowned shortly thereafter. It was August 22nd, 1485 and the end of the War of the Roses. 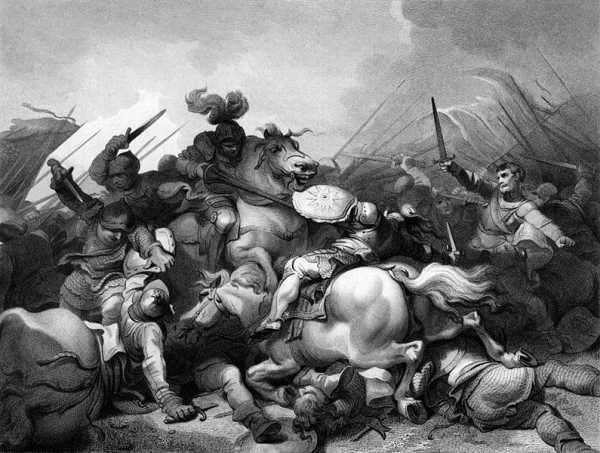 Richard had the larger army, and was said to have chosen the ground for the fight, but things didn't go his way. And since that time, which was so formative in English history, the Brits had misplaced the battlefield. Since we live on such a dynamic planet, that which was here once disappears and shows up over there. The original site of the battlefield was thought to be at the foot of Ambion Hill in West Leicestershire. Archeologists, led by Glenn Foard of the Battlefields Trust, armed with metal detectors spread out over the fields where the battlefield was supposed to be and found old Anglo Saxon remains, but nothing from the battle. In 2009 they finally pinpointed the location about 2km away from the supposed site when they started finding cannonballs. In fact, they found at least 22 shot of all sizes, which fit handguns to large cannons, which is actually more than in all the Medieval battle sites in England and the continent combined, according to Mr. Foard. The shot had been scattered over a kilometer. There was a lot of work done in finding the battlefield, not just metal detector work. The team studied all the available manuscripts and documents from the era, analysed soil samples looking for marshland that wasn't there anymore, scoured the countryside finally with metal detectors, and analysed the finds. Some of the artifacts finally clinched the deal, a small silver boar that would have been worn by one of Richards retinue, and most likely the place where Richard was killed. Other artifacts also found were parts of high end sword hilts that could only have been carried by nobles. The exact location is still secret, as the Trust worries about battlefield looting as had happened in the past. However Mr. Foard thinks this unlikely as the amount of work to get the few artifacts that they've got out of the ground has taken a lot of work.